« Older: Crazy, Crazy Wind. What do you do? Current Position: 37 23.41 N 025 15.76 E Click to view map. 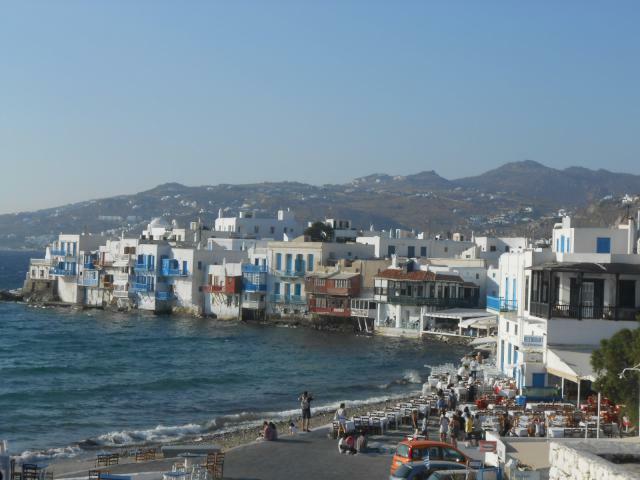 Welcome to Mikonos, the island of Paradise! 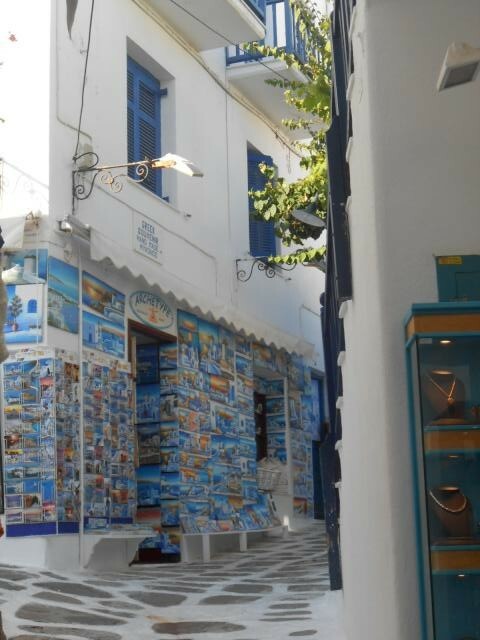 The most cosmopolitan destination in Greece, known for it’s long sandy beaches, clear waters and brilliant sunshine.And shopping…..ahhhh, the jewlery!!! 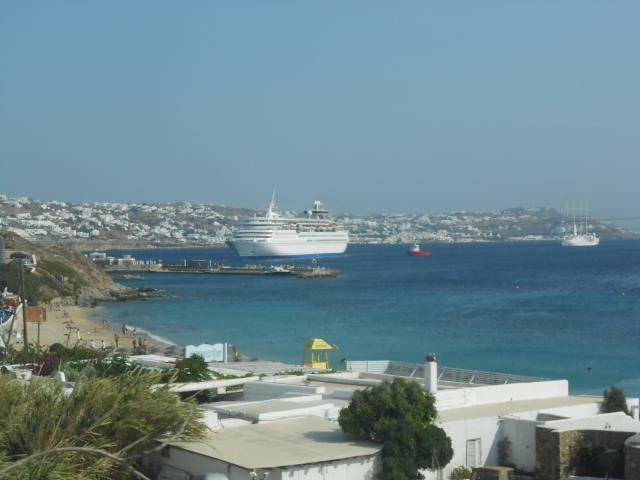 Upon arrival in Mikonos we parked ourselves in a beautiful spot right in front of Ornos beach bellow, about 3km south of downtown. Nice sandy bottom, good holding. 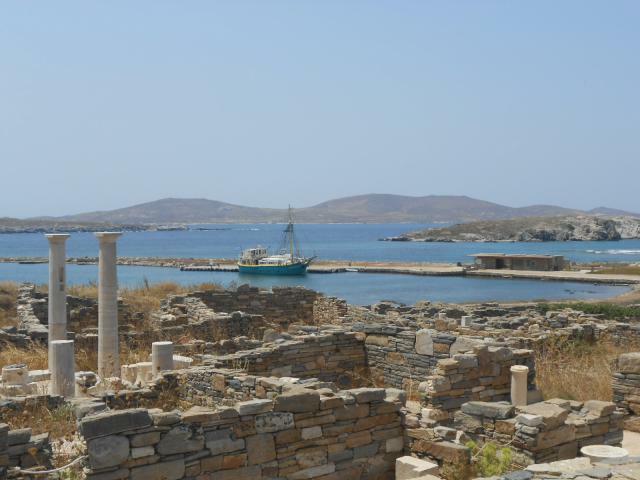 It was such good holding that one morning we were ready to sail to Delos and we couldn’t actually get out of there. Noel took a snorkel and realized that we had a large grapel wrapped around our anchor. Someone came by in a dinghy to let us know there was a diver available, it happens there all the time. Noel sent him away and we Did It! with a trip line and many manouvers, 1 hour later we were out of there. It was a very busy area with many mooring balls and chains, anchors, yachts and fishing boats. 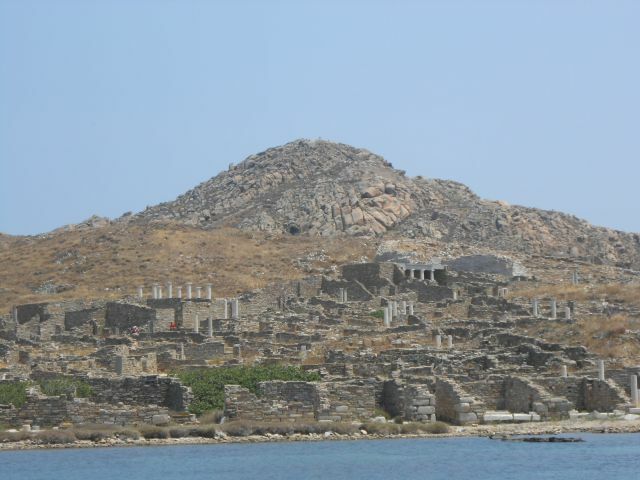 We went and anchored just a bit further out and planed Delos for the next day. A few days later we were nicely anchored in another Island of Fourni and we got to help another boat next to us who had the same problem, except they had the grapell all the way up wrapped around their anchor just bellow their bow. Noel ran across with the dinghy and help them release it. (at least this time we were not the ones providing the entertainment!) We call it the anchor game. 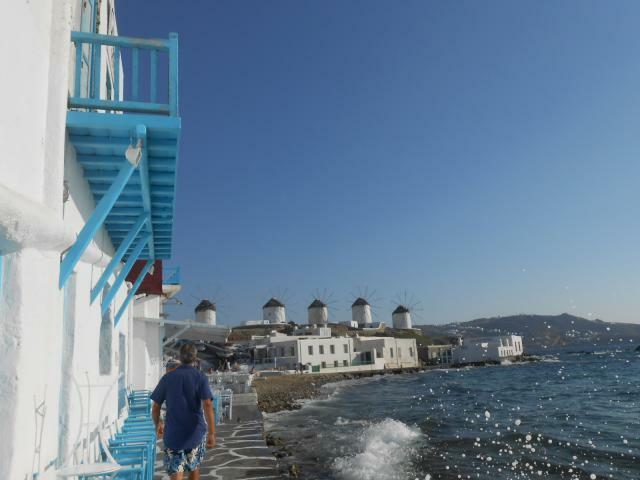 Mikonos water front and the famous windmills. We were fortunate to have a driver and guide to show us around the island. 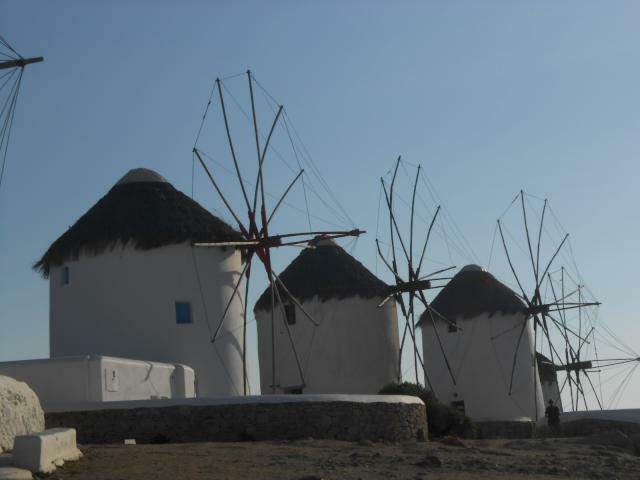 We met up with a Vancouver couple that own a house in Mikonos and spend Summers there. Jon and Lucy also cooked us dinner twice and we watched a pretty sunset from their place. We had previously met them in the Caribbean 3 years ago, while sailing there. 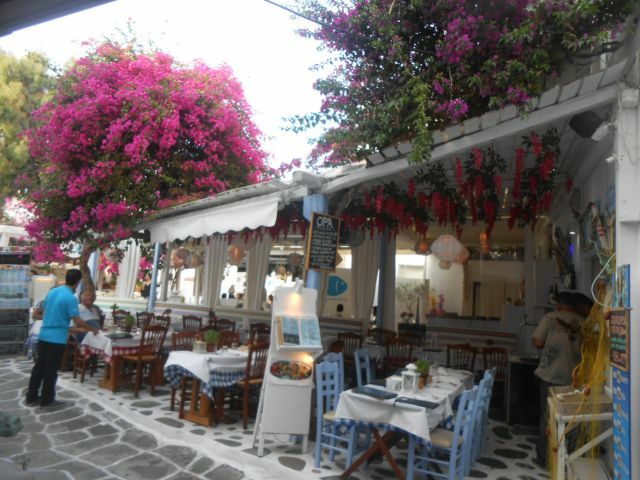 Mikonos has a very chic ambiance. Beautiful upscale hotels and honeymoon suites and infinity pools all over the hills with magnificent views. 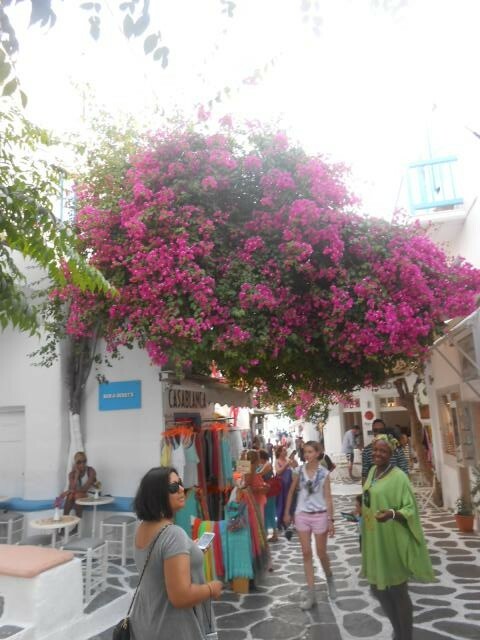 Hundreds of jewelery stores everywhere, off beat galleries, beachwear and designer clothing, it’s all there. We were there 3 times, including 1 evening. We enjoyed the food, the art and the beauty along the turquoise waters. Ahhh, we also enjoyed a beer for 6 Euros and 5.50 for a little cappuccino. What a shock to the system (and the wallet) we were used to pay 2 Euros a beer and 1.30 for the cappuccino in Italy. We really enjoyed our time there though. This place is known for the outrageous nightlife as well. From bars, discos, gay bars and gay beaches, honeymooners, surfers, incognito rock stars and their yachts, everyone stops here, even if is just for one day. The excellent facilities for conferences and meetings, its no wonder is such a busy place. 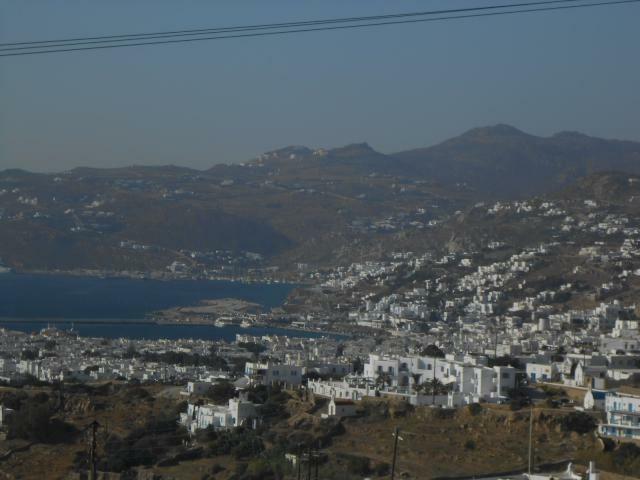 The island is bare, just like most of the Cyclades. In the Spring though it does have one of the richest floras in the Aegean with it’s hills covered with wildflowers. He was sure walking fast. Did he want to be in my photo Again???? The labyrinth of tiny streets and alleyways. Love the streets. We walked there 3 times and were still finding new places and things to see. It was a total maze. Noel says: we’re lost. I say: lost??? 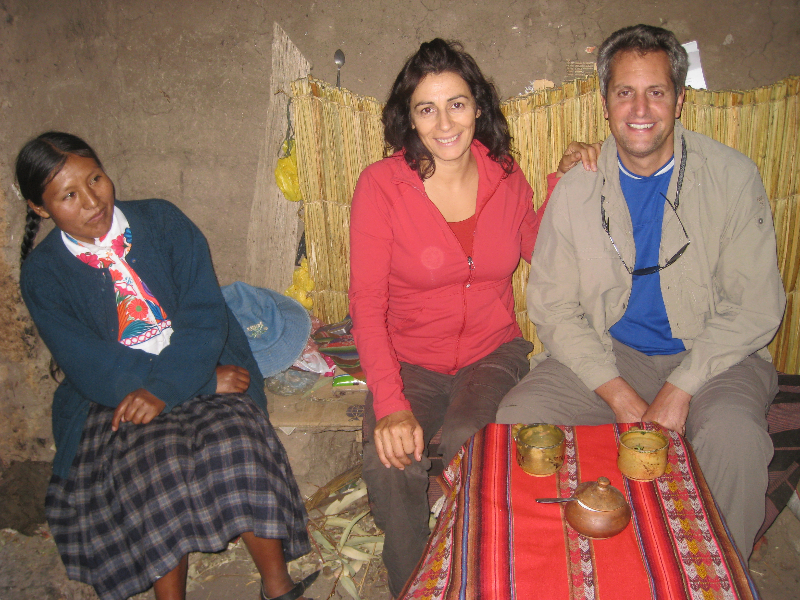 in a beautiful place with a beautiful man….Nah! 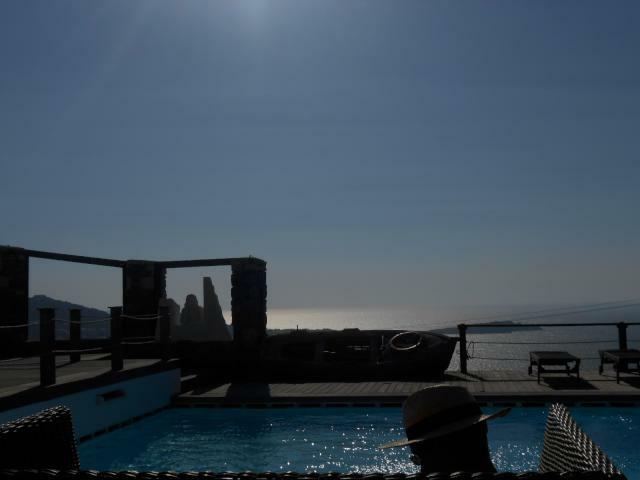 During the tour of the island Jon took us to this beautiful hotel bar overlooking Mikonos. Magnificent views, although was quite hazy for photos. 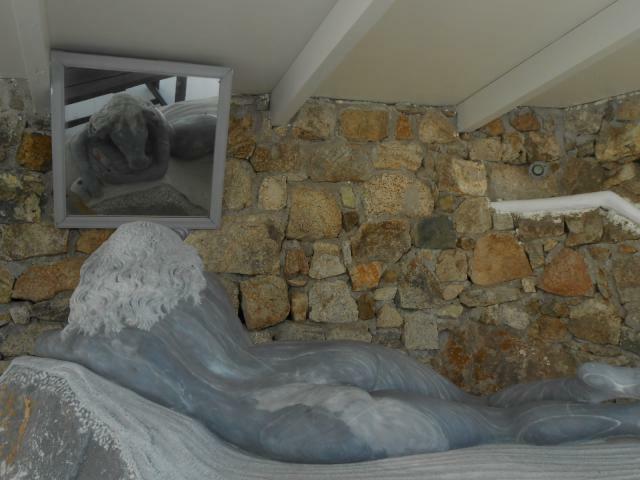 Besides the great views, there were also some beautiful , exquisite pieces of art around the pool area and foyer from a local artist. A lovely sculpture of a Minotaur – human body, bovine head. With a mirror positioned so we can see the head. 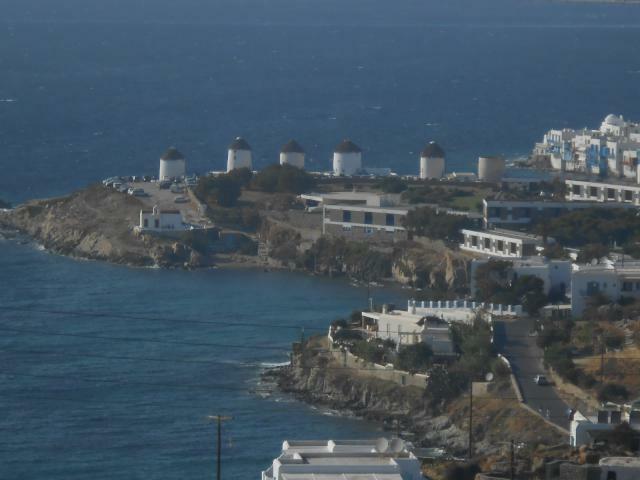 We passed some beautiful beaches of Mikonos. 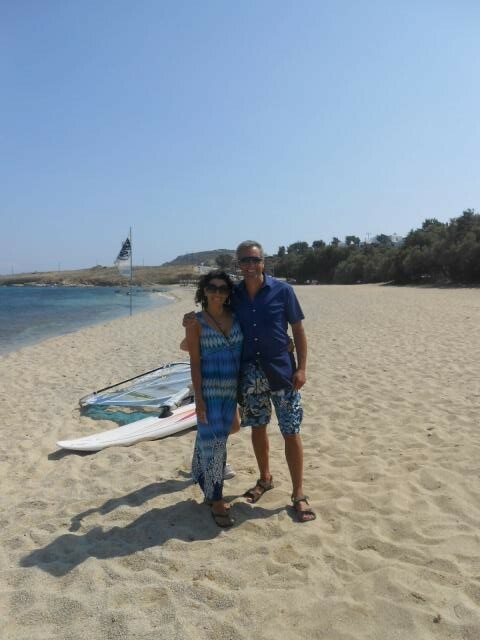 We stopped and checked out this windsurfing beach. Didn’t do any, though. 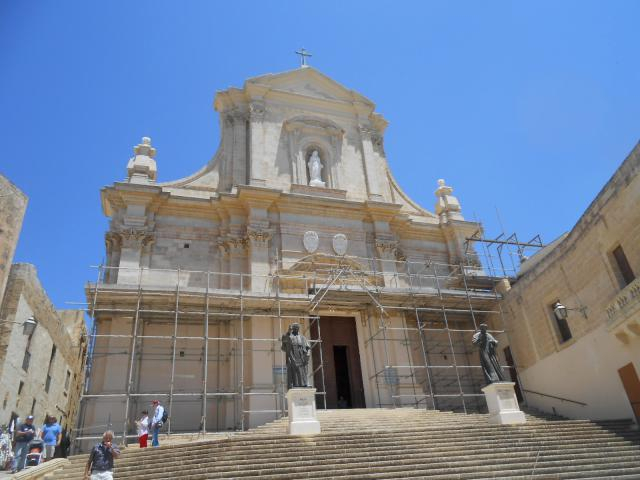 And of course we must always visit at least 1 Church in every place. Don’t we always want to know what’s hiding inside the blue or red roofs??? 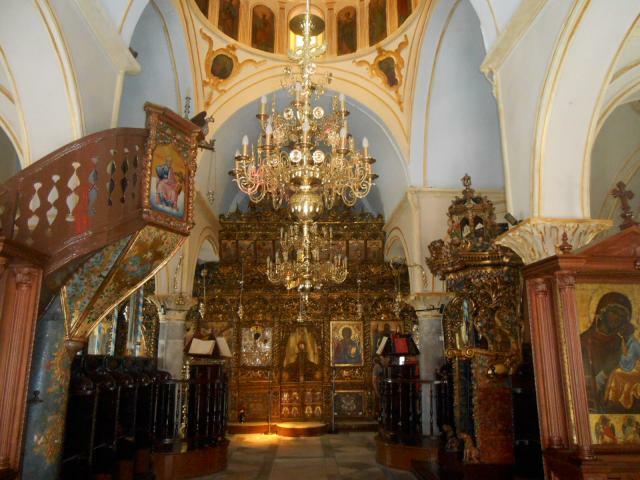 ?There are some amazing churches! (And they are not all the same, Noel!!!) He keeps saying that, but yet many times he is still amazed over and over! 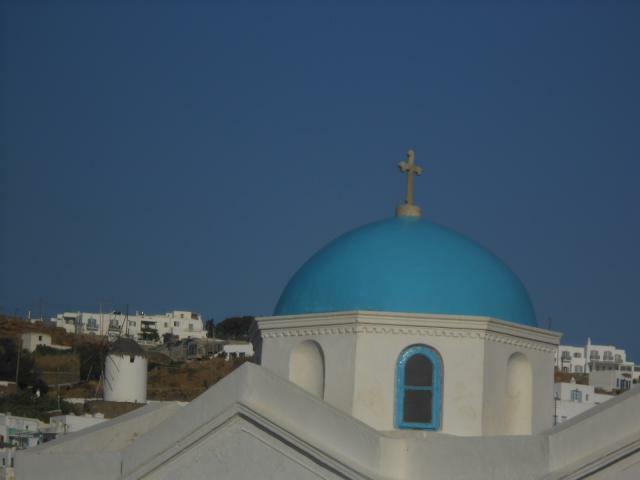 There are so many churches everywhere though. We read there are 365. As we sailed in you can see little chapels all over the hills. Jon told us if you build a church in your property you get a tax break. 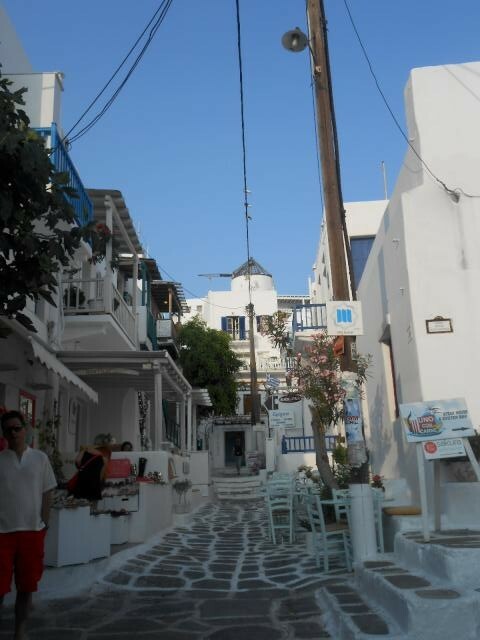 After our failed attempt to leave Mykonos yesterday, we had another attempt to go there with Jon and Kaley today. Since Jon works Vancouver hours from home, we didn’t get away until lunch time, which meant that, after our sail around the corner to Delos, we didn’t arrive there until 2pm. The problem is that the park closes at 3pm. 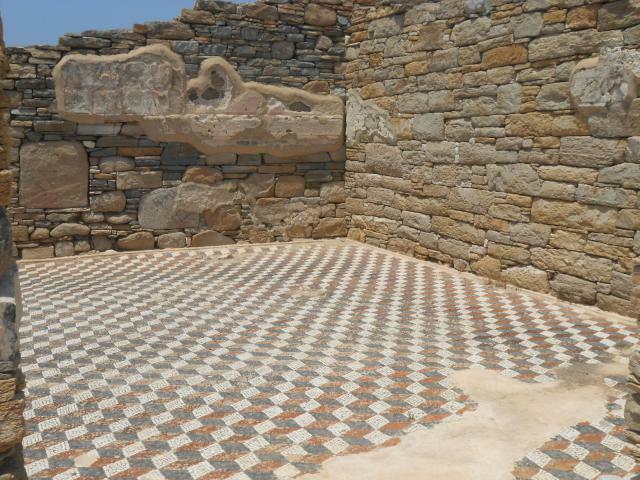 I suggested to the security woman that it was an awfully early closing time, but she informed me in no uncertain time that 3pm is the time at which every archeological site everywhere in the world closes. Hmm. So we had one hour in which to tour one of the largest archeological sites in the world. But at least we had Jon with us. 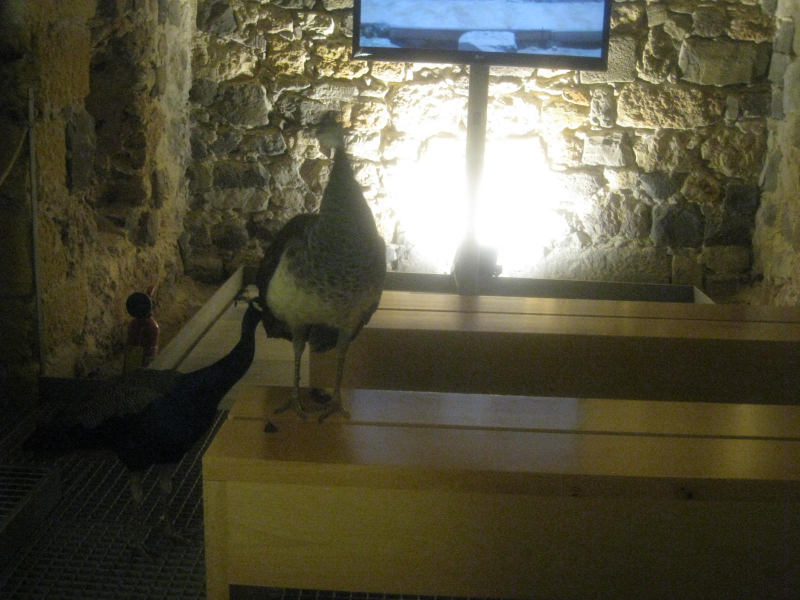 He had been here several times, and had also had a private tour with one of the archeologists that Lucy knows. So he was able to give us the guided tour! As it happens, we saw pretty much all of it in our whistle stop 1hour tour, except for the Museum. We did try to get there, but it was ten to three, and that woman was keeping her beady eyes on us to make sure we were actually at the exit gate by 3pm. We keep saying we will not bother to see more ruins, we have seen so many. But then, when I see this one for example still has a lot of the walls and erected beautiful marbled doorways and windowsills and tiles. 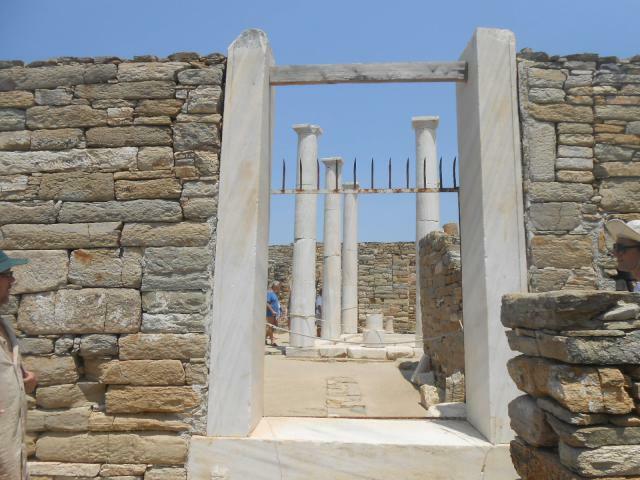 People from all over the world come to Mikonos for this historical site. I read the history and I am just fascinated each time. So we keep going and each time I am amazed. Only the Tour boats are allowed in the Quay. We are anchored just a bit far down. No one is allowed in the waters at all anywhere around day or night. They have very high security around the sacred city. 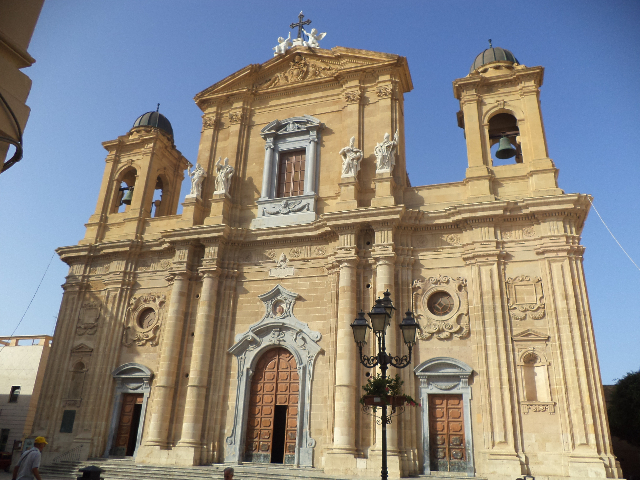 It is said that this city had 30,000 inhabitants in it’s day. Only a small part of it has been excavated. One can see ruins all through out the island, besides this site. 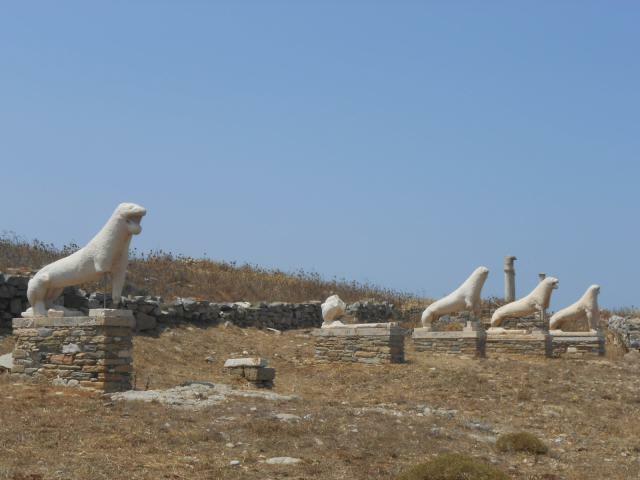 These lions are one of the highlights of Delos. And they look spectacular. But, in fact, they are made of glassfibre! The real ones are in the museum for protection! 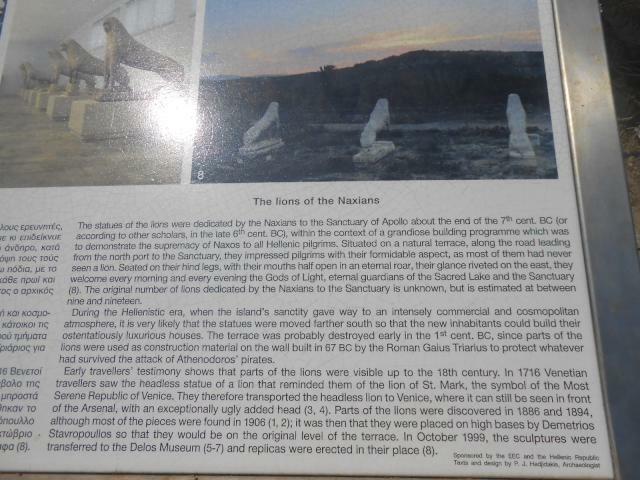 Across from the lions is the sacred lake where Apollo was born. Apollo is the God of light. 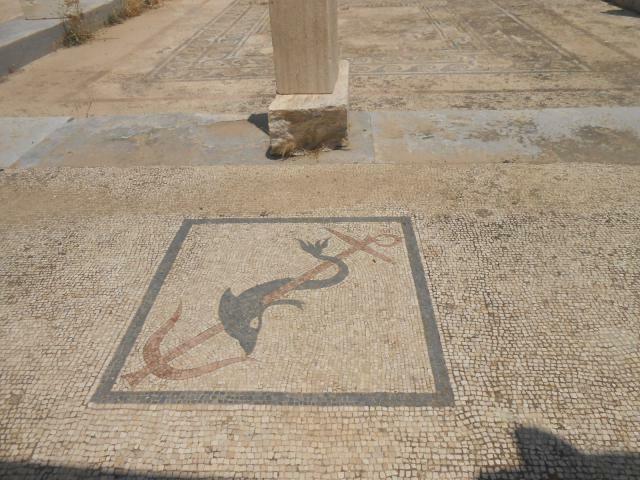 There are certainly some beautiful mosaics here. Apparently this deserted island of Rineia is basically a necropolis. Both islands are deserted. 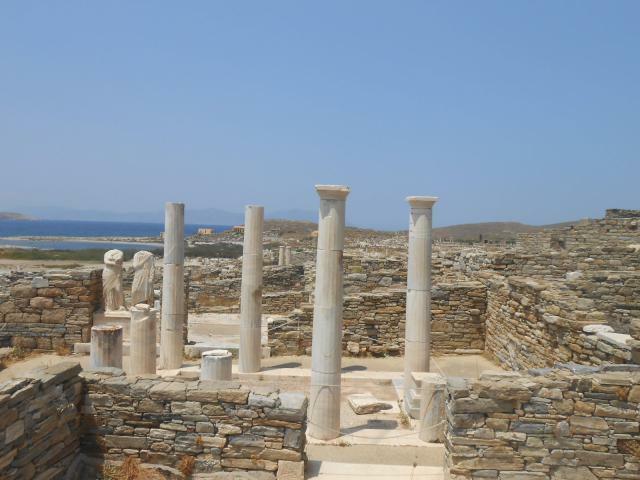 In Rineia and around Delos there are a few small beaches and many of the locals do day trips there to escape the craziness of Mikonos. We enjoyed yet more ruins!!! We even have seen more since then! 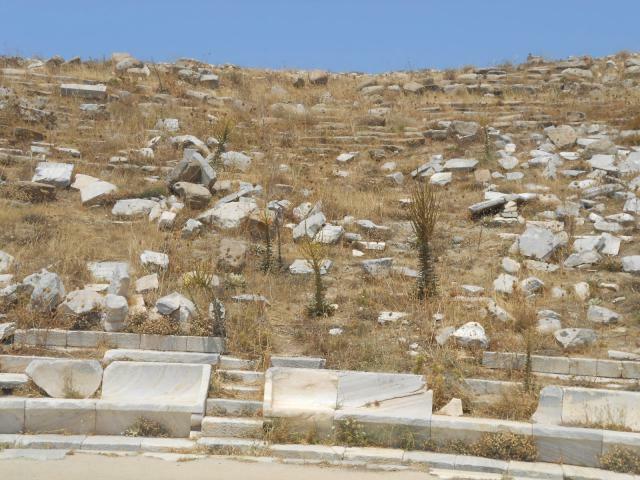 Stay tuned for Ephesus in Turkey. What are grappels? Our computer is not showing photos today, maybe tomorrow. All your spectacular photos have come up now. The minotaur seemed to be female. I get tired of ruins. This post was so interesting, especially all those ruins and people not allowed to be born or die there, but on anothe island. See I did read all the way through. When did you say you were back here ? Was is it sometime in August Ceu?? We are having some lovely hot summer weather here and the lake is great for swimming right now.